Our last two weeks lessons was all about the ibadah umrah. We discussed about the ibadah and went through the rukun and also the sunnah for each rites. We discussed the forbidden things to do. What halal things that become haram during the ihram. We tried to memorise the supplication, the niyah, talbeeyah, the dua befoe entering Kaabah area, looking at hajaratul aswad, the supplication between rukun yemeni and hajaratul aswad. I checked the children’s recitation of suratul kafirun. Then we memorised the saee’s supllication. I told them the story of Prophet Abraham a.s. and Siti hajar and Prophet ismael and how the ritual of sa’ee began. I emphasised on the sacrifice that all of them made for the sake of Allah. It is important for us to see the story of Siti Hajar on how when she learnt that Prophet Abaraham a.s. left them in the barren desert by Allah’s order, she was content. She submitted and believe that Allah will protect them. This is something we need to keep repeating to the children (and ourselves). Allahs asks for us now to obey Him, do things that are told, do extra things for Him to please Him and to stay away from haram. Instill to them that we need not question Allah’s order and submit to Him alone. S wanted to shave off her head too, listening to this hadith. Allah makes things easier for woman, Alhamdullilah, we are spared from doing so. 4. Read the Quran. Try and set a target to complete. To complete it would be good. 5. Perhaps set a target to memorise more surahs. 6. We can do ziarahs to some places. Among them in line are visiting all the places for hajj rites. H really wants to to visit the Mount Uhud. He wants the feeling of climbing it too. I prepared a document of a simple guideline for the kids to do umrah. I also printed out the basic supplications and printed them out on small cards. They will look at them this week and have them memorised Insya Allah. You can check them out here. I urge you to inform me of any mistakes in this document so that I can have it rectified where appropriate and thus we can learn from each other. The cover page is designed by S. Then both H and and Z wanted their drawings on the book too. I will perhaps edit this book and put their drawings in the book itself. For other supplications, as the sunnah is, there are no specific supplication narrated in hadith. I gave them some tips to help them focus on the dua that they can make, Insya Allah. I pray to Allah that He accepts this humble effort of mine to help bring the children closer to Him. We made a practice of doing the umrah. And doing pretend tawaf and sa’ee. In fact the whole do. They had fun and I believed it helped them understand the whole rites. Prophet Muhammad s.a.w. is also known as Al Ameen meaning the truthful one. He was known for his good character, his honesty and truthfulness. So the Prophet s.a.w told the people about Allah and they should worship Allah alone. May you perish means I hope you die! Abu Lahab is Prophet Muhammad s.a.w.’s uncle. Abu Lahab, i.e. the Father of the Flames, whose name was ‘Abdul-‘Uzza and means the servant of the idol ‘Uzza, was a man of fiery temperament with a reddish face. This nickname, perhaps, was chosen for him, because, ‘lahab’, in Arabic, means ‘a flame of fire’. Ever since Prophet Muhammad s.a.w began to spread Islam, Abu Lahab became his enemy. He used to often cause harm to the Messenger of Allah s.a.w. even though the Prophet is his own nephew. When Prophet Muhammad s.a.w was born, Abu Lahab was so happy he went to free a slave. But after Prophet Muhammad s.a.w. invited people to worship Allah and leave the idols, he hated him and scorned the religion. Whenever Prophet s.a.w goes to the market to spread Islam calling the people to worship Allah, Abu Lahab would follow him and shouted, “Verily! He is an apostate and a liar!” He was following behind him (p.b.u.h.) calling the prophet s.a.w a mad man and pelting his feet with stones, causing the holy Prophet (p.b.u.h.) to walk with bleeding wounds. Perish the two hands of Abu Lahab and perish he! This is a supplication against Abu Lahab and the second is information about him. His wealth and his children will not benefit him! Abu Lahab was a rich, proud man who boasted about his wealth and used it against Islam. Allah said that all his wealth and his children will not benefit him at all. He will enter a Fire full of flames! Then Allah said He will enter a fire full of flames. Allah has promised Abu Lahab hell even before he dies. This ayaat was sent down even before Abu Lahab dies. Allahu Alim knows that Abu Lahab would not be among those who will receive guidance and will be sent to hell. Who is Abu Lahab’s wife? 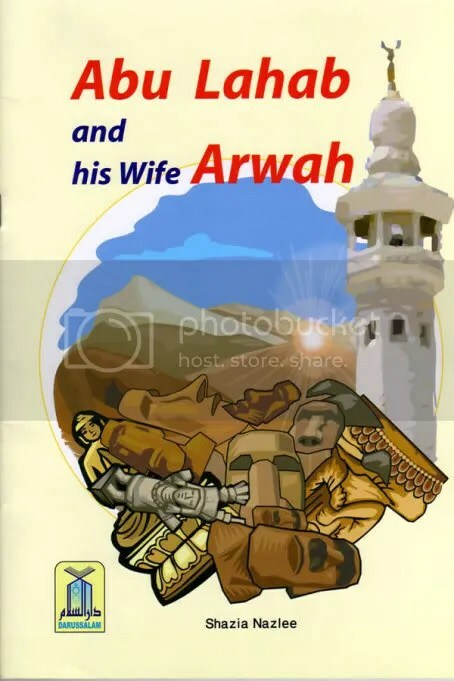 Abu Lahab’s wife is Arwah Binti Harb bint Umayyah. She is one of the leading women in Quraysh. Also known as Umm Jamil. She is also the sister of Abu Sufyan. She was very supportive of her husband’s hatred to Prophet Muhammad s.a.w. She used to place thorns in the path of Prophet Muhammad s.a.w. with the intention of hurting him. She will carry the firewood and throw it upon her husband to increase his torment. And she herself will be in the hell fire. In her neck is a twisted rope of Masad. In her neck will be a tight twisted rope. Some said made of fibres. Some said skin animals and some said made of iron. I prepared a follow through worksheet for the children to help them explore this surah, Insya Allah. I emphasised on the who/what/why/when/where whichever is applicable. 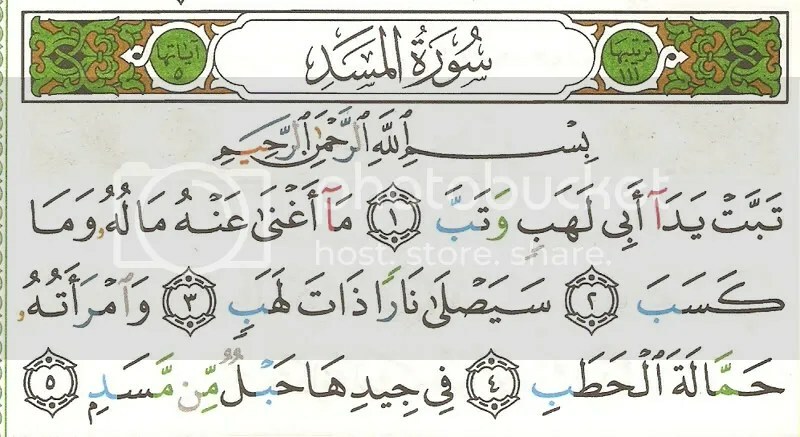 In this surah there are two body parts that are mentioned which are hands (يدا) and the upper part of the chest (جيد). We explored the description of these body parts and what Allah described what will happen to them in this surah. 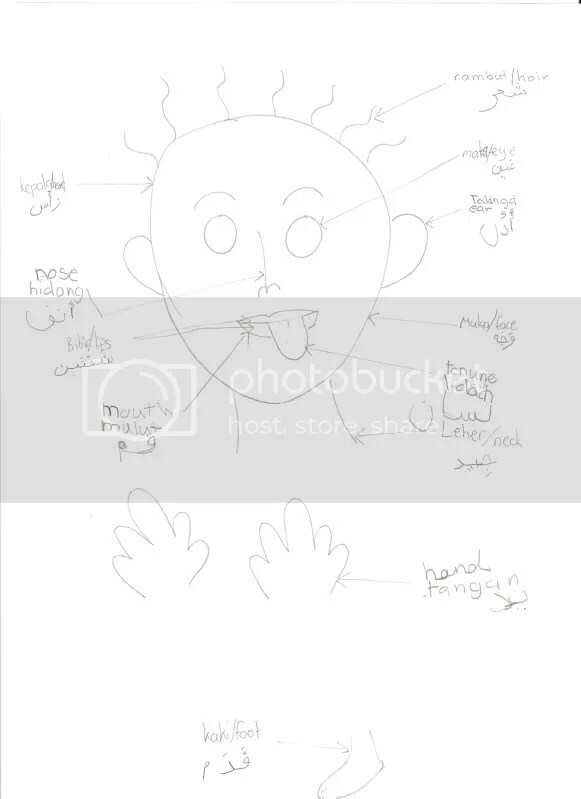 I introduced some basic arabic words for body parts. Allah described that Abu Lahab’s wealth and children will not benefit them. Finally we discussed the lessons that we can gain from this surah, Insya Allah. 1. Relationship does not guarantee faith. Even though, Abu Lahab is the Prophet’s closest uncle, this does not guarantee he has any benefit of the true faith. The same goes to us. We pray for guidance for ourselves and our children to always be in the straight path and not be misguided. 2. 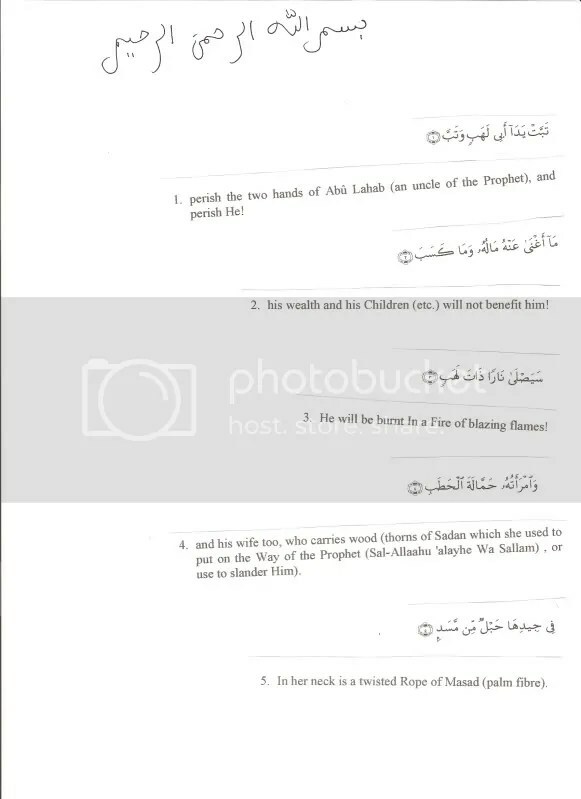 This sura is about ABu Lahab and his wife but also more on their behaviour and thoughts against Prophet muhammad s.a.w. and Islam. Thus they are cursed for this. Thos individual who have the same quality are also cursed by Allah. 2. Those who curses Prophet Mohammad s.a.w. will go to hell. 3. Assisting those people will put you in the same place too. Allah’s Apostle (s.a.w.) said, “Whenever you hear the Adhan, say what the Mu’adhdhin is saying. There is no power or might save with (except) Allah. ‘Abdullah b. Amr b. al-As reported Allah’s Messenger (may peace be upon him) as saying: When you hear the Mu’adhdhin, repeat what he says, then invoke a blessing on me, for everyone who invokes a blessing on me will receive ten blessings from Allah; then beg from Allah al-Wasila for me, which is a rank in Paradise fitting for only one of Allah’s servants, and I hope that I may be that one. If anyone who asks that I be given the Wasila, he will be assured of my intercession. To invoke blessings upon the Prophet (PBUH) means to recite “Allahumma salli `ala Muhammadin, wa `ala ali Muhammadin, kama sallaita `ala Ibrahima wa `ala ali Ibrahima, innaka Hamidun Majid.” Wasilah literally means that mode or method by which one attains his goal, but here it stands for that high rank in Jannah which will be awarded to the Prophet (PBUH). Allah’s Apostle (s.a.w.) said, “Whoever after listening to the Adhan says, ‘Allahumma Rabba hadhihi-d-da’ watit-tammati was-salatil qa’imati, ati Muhammadan al-wasilata wal-fadilata, wab’ athhu maqaman mahmudan-il-ladhi wa’ adtahu (O Allah! Lord of this perfect call (of not ascribing partners to You) and of the regular prayer which is going to be established! Kindly give Muhammad (s.a.w.) the right of intercession and superiority and send him (s.a.w.) 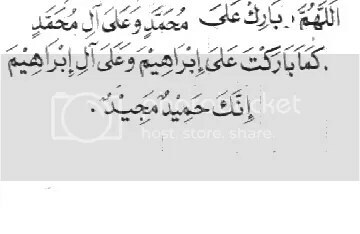 (on the Day of Judgment) to the best and the highest place in Paradise which You promised him)’, then intercession for me will be permitted for him on the Day of Resurrection”). The word Shafa`ah means to beg someone to pardon somebody’s faults and shortcomings or to request someone for doing a virtuous deed. In the context of this Hadith, it refers to the privilege of intercession of the Prophet (PBUH) due to which he will request for the forgiveness of such people for whom he will be given permission by Allah. Why do we make this dua? 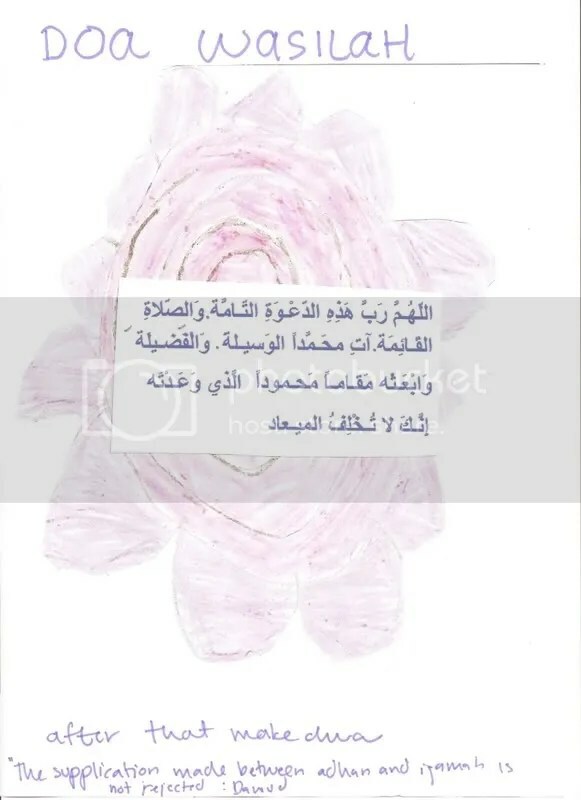 We make this dua because we are praying that Prophet Muhammad s.a.w will be given the right of intercession (shafaah) by Allah and we pray that we too will be rewarded by this. This is certainly what we need on judgment day. Judgment day would be very difficult for all of us, and Insya Allah with the will of Allah, intercession will be given to Prophet Muhammad (s.a.w. ), and the difficulties on that trying day would be alleviated. Prophet Muhammad s.a.w., with the will of Allah, will be given the syafaah to ask Allah to hasten the judgment process. Read about intercession HERE. Then tell the children the story of syafaah in general. The supplication made between the adhan and the iqamah is not rejected. 1. Respect the adhan by stopping conversation. Even reading the quran. 2. Stay focus on the adhan. 5. Make dua between azan and iqamah. I cut out out the words of adhan and jumble them up together with the response words. H is to arrange the adhan words while S is to label the correct response to them. I also pasted the sallah to the prophets that we should read after hearing the adhan. We then took turns to read it and get familiar with them. We also pasted the doa wasilah. We will stick it on one of the walls, Insya Allah, so that we can refer to it quickly as soon as we hear the adhan. Living in a Muslim country, the adhan can be heard loud and clear from the many mosques around us, Subhanallah. For now I don’t expect S to be able to memorise all of the quickly. However if we strive to practise this sunnah, Insya Allah the memorising part will be made easy. may Allah makes difficult things easy for all of us. If one hears the adhan when he is in the mosque, one should not leave the mosque. Abu Sha’tha’ reported: While we were sitting with Abu Huraira in a mosque a man went out of the mosque after the call to prayer had been announced. (A man stood up in the mosque and set off.) Abu Huraira’s eyes followed him till he went out of the mosque. Upon this Abu Huraira said: This man has disobeyed Abu’l- Qasim (Muhammad) (may peace be upon him). Listen to the adzan for practice. This hadith tells us that we need to give our highest love to him above our parents, our children and the people we love. How do we love our prophet s.a.w.? By practicing what he teaches, believing in his message and staying away from the things that he did not do. We should strive to carry out his sunnah and stay away from things that he did not teach. Insya Allah, this is what we will strive upon. I have an interesting audio that you may like to listen. This is a lecture by Hussein Yee. He is a daawah activist based in Malaysia. Reverting to Islam, he now does daawah all over the world, Masya Allah. He recently came over here. I think his lecture is apt for this entry. Before we start the lesson, we revised back the story of how the Adhan first started. I did this by asking them to narrate the story in turns. This week topic is a continuation of the subject adhan. Today we highlighted the excellence of adhan that are found in the hadith. This hadith tells Syaitan runs with great speed and he breaks wind, or he intentionally makes noise. Basically it shows that Syaitan will try to avoid the adhan. The second point is we must strive to stay focus in solat. It’s easy to narrate this hadith for any children love the word fart. I stressed on the point that Shaytan will try to avoid the adhan and try as he might to make as much noise as he can. 4. To pray in congregation for Isyak and Fajar. Children always love reward stories. This is the best time to talk about certain deeds that have high rewards. On the Day of Requital, Almighty Allah will grant the faculty of speech, and all these things will testify for the Mu’adhdhin, as would be done by mankind and jinn. It also tells us hat even we are in the outdoors traveling for instance, we should still call out the adzan. Part of what I parted to them was how during the judgment day, you will be surprised by the the unknown witnesses (to you) who would come up and tell Allah that you did so and so. We are outdoor lovers, and hadith like this is a great tip especially for my son, to remind us the importance of doing adhan, and not to mention the reward that comes with it, Insya Allah. Isa bin Talhah said: I was with Mu’awiya b. Abu Sufyan r.a. when the Mu’adhdhin called (Muslims) to prayer. Mu’awiya said: I heard the Messenger of Allah (may peace be upon him) saying The Mu’adhdhins will have the longest necks on the Day of Resurrection. This Hadith highlights the eminence of Mu’adhdhin and Adhan. Adhan means calling people to the worship of Allah. Mu’adhdhin (the caller) gets reward for the Salat of all those who hear his Adhan. The phrase “will have the longest necks” has been given different interpretations. One of them is that they are those who long for the Mercy of Allah more than anyone else. 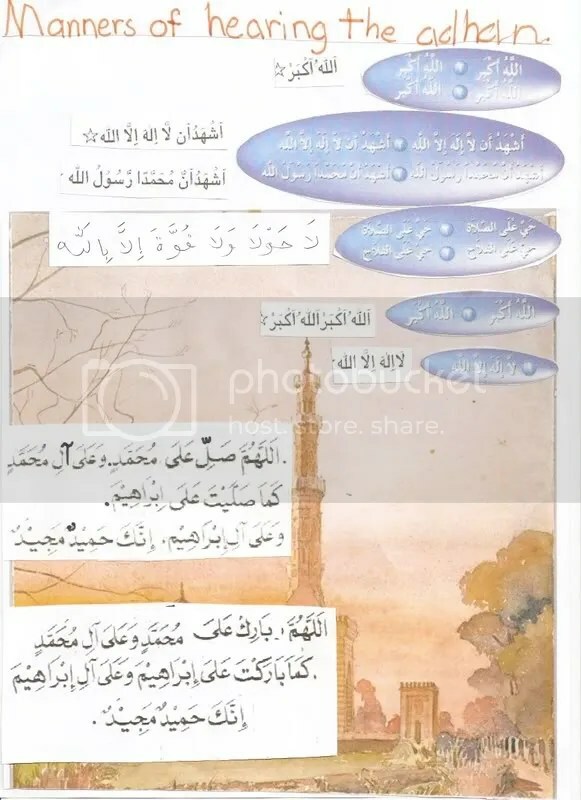 Another interpretation is that their necks will grow longer on the Day of Requital and so sweat will not reach them, for every one will sweat on that day depending on his deeds: sweat will reach up to one’s ankles or knees or waists. In the case of some people, sweat will reach up to their mouths. Another interpretation is that those who call Adhan will have an honourable and great status on the Day of Requital. I reminded them that during the judgment day is the time that Allah will make us show our true deeds by some signs. For the muedzins for example will be recognised by their long necks, the ummah of Muhammad s.a.w. will be recognised by the beauty of their wudhu’ body parts and so on. When you go outdoor, select someone to announce the adhan before praying. Pronounce the adhan loudly for all the creations of Allah can hear the adhan. And they will be the witness of the adhan in the judgment day. In the judgment day, the muedzins will have long necks and they can be easily recognized due to this feature. They are asked to put up the summary of the excellence of adhan in point form. I intended to continue with the manners of listening to the adhan (which is actually the main objective of these adhan series), however we were blessed with a few guests so we had to stop the session and will resume the lesson Insya Allah, next week.